Managing Quail Fields is a DVD release from Quality Wildlife. 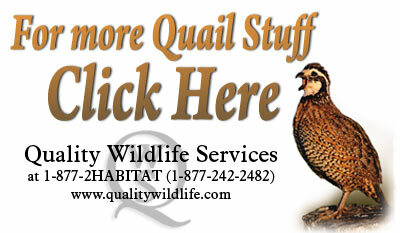 This is a great resource for anyone raising, or managing the Quail Habitat on their property. Please watch the short preview below, and see how this can be a useful tool for your property! 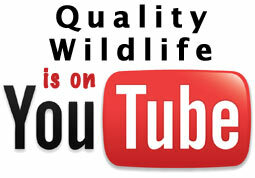 Wildlife Biologist Jim Evans makes this a really fun and a very informative video to watch. How long are the videos, Managing Quail Fields and Johnny Houses and Adding Quail to your Quail Hunting? The Managing Quail Fields video is about a half hour long. Roger Wells is the habitat coordinator for Quail Unlimited. He reviewed this video and told us that this was the best quail habitat video he had ever seen. Roger recommended it for both the experienced manager as well as a novice just getting started. Putting Quail Back in Your Quail Hunting is about an hour long. conduct a pre-season (or early release) of quail. Looking to start a quail Hunting facility and need some tips on how to accomplish and tips on pros and cons …please email me back. How many acres of quail habitat do you have? Is this for private use or commercial use? What state and geographic area is it located? You said you have 240 acres in Tenn. and that this would be for private use. If you keep scrolling through the posts on Boots and Briars you will see the article we posted by Dr. Ron Haaland entitled,” Quail on Small Acreage. This will give you a lot of good information. Also you may want to go to qualitywildlife.com and obtain our DVD called Putting Quail Back in Your Quail Hunting. This DVD explains all the elements required for a successful preseason quail release project. Once you read Ron’s article and seen the DVD, you will have plenty of basic information to help you sort out what option is best for you. I will be glad to talk with you about any specific questions you may have, but our phone time will be much more productive if you have already seen the DVD. My office phone is 706-554-7460.